iOS 7 revealed a lot of features that added functionality to what iOS 6 currently offers, in addition to of course the redesigned UI, but Craig Federighi simply did not have enough time to go through all the features iOS 7 introduced, so let’s take a look. View PDF annotations – Previously in iOS you were unable to view annotations that someone else has added to a PDF. It seems that iOS 7 enables this feature, bringing more functionality to PDF documents on iOS. Enterprise Single Sign-On – Focused on the enterprise users, iOS 7 adds the ability for companies to implement SSO for its employees on sites and services commonly used on iOS to prevent the need for continual entering of credentials. Turn-by-turn walking directions – Self explanatory really, but a feature that was available in Google Maps is now available in iOS Maps. Do Not Track option in Safari – Ported from the desktop version of Safari, this blocks websites from tracking you online. Improved Mail Search – No real details of this one, but a welcomed improvement over the current implementation. Night mode for Maps – Finally maps will be easier on the eyes. Passbook Passes – Looks like you’ll be able to scan codes at a store to get a Passbook Pass for various offers etc. available. App Store Volume Purchase – Enables the ability for developers to offer bulk discounts for App purchases. FaceTime Audio – VoIP implementation of FaceTime to allow calls with just audio. WiFi HotSpot 2.0 – This will allow users to connect to public hotspots without having to do anything. This means you can walk around a city and jump from hotspot to hotspot without having to login each time. 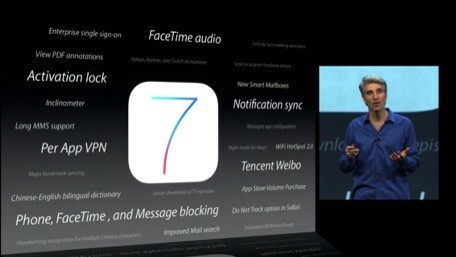 These are just some of the unspecified features of iOS 7, which is looking to be an extremely significant and feature-rich update. Whilst a lot of focus was placed on the redesign of the UI, there are many features that make iOS 7 a substantial update.